The sculpture “Hare” by Barry Flanagan stands inside the house and tempts the resident fox. 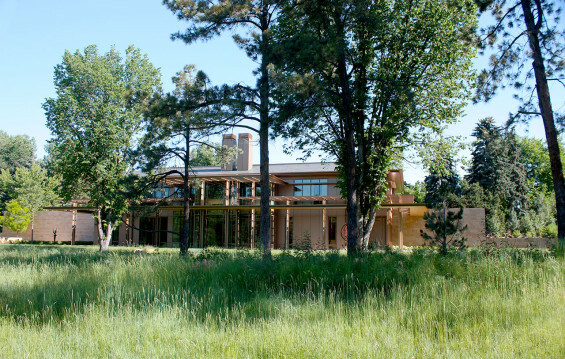 Denver’s regional landscape becomes the metaphor for this 3-acre estate. 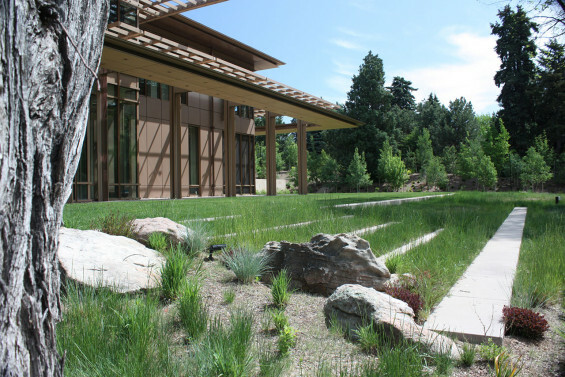 Inspired by the Denver landscape of mountains, prairie, and mowed turf grasses, we emphasized the change of seasons, native plants, and a fusion between landscape, art and architecture. 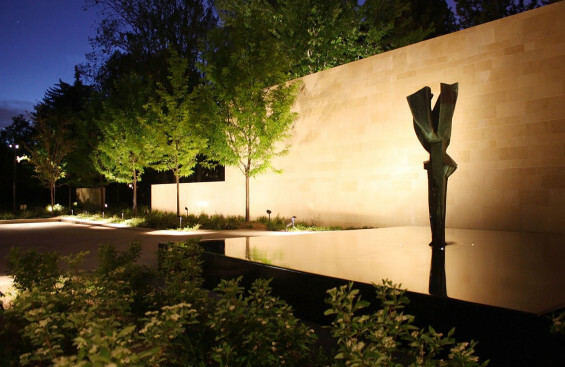 The landscape features outdoor rooms, framed views to barrowed landscapes, and provides a habitat for wildlife and a substantial collection of sculpture. View across meadow showing Ponderosa pines and American elm. The mature trees lend sense of timelessness to the setting. The meadow steps to the lawn are almost consumed by the meadow grasses. 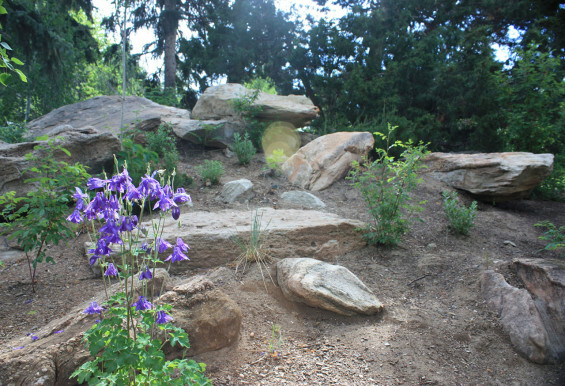 The remnant boulders are interplanted with native herbaceous plants. Cherry Creek is one of the most beautiful established neighborhoods in Denver. 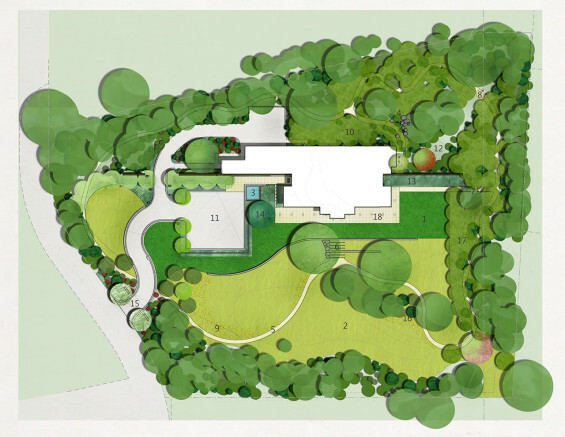 For the landscape architect the planned removal of the existing house produced the opportunity to re-use relics of the existing landscape to help inform the site plan, layout the roads and pathways, and shape views from inside the new robust, and clearly modern home. In addition to this, the excavation required us to construct a firm foundation and basement in a high water table that produced a substantial amount of earthwork cut. Instead of hauling the material away, we used it to create a great mound that winds through specimens of large conifer trees. The new residence is sited carefully between the rolling topography of the prairie metaphor on the sunnier southwest side and the mountain metaphor of forest landscape on the northeast side. The iconic lawns familiar to Denver are vastly reduced to a “useful” lawn in the middle. Each of these landscape precincts shows preference for native plants, as unique plant communities that all lead to a diverse and water wise composition. 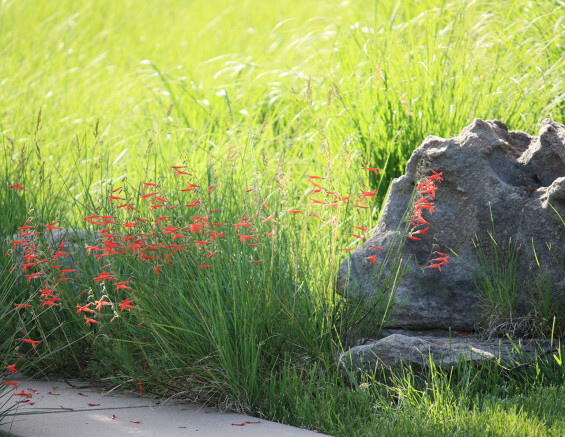 Bright red penstemon grows in the spaces between natural boulders and meadow steps. 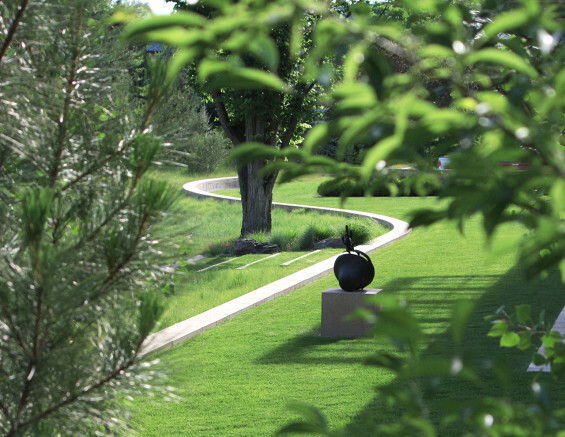 A half-mile long meandering path now offers a place to wander through the shady aspen forest, an open wildflower prairie, and a significant collection of sculpture and existing preserved arboreal setting. A series of small and large alcoves along the way provide space to spend time outside, entertain, and observe daily and seasonal changes. Of these, the “conversation point” is the most dramatic because on the clearest of days you can catch a glimpse of the Rocky Mountains from under a prairie oak tree at a table with two chairs. The serpentine wall defines the boundary between manicured lawn and the “wildness” of the meadow. 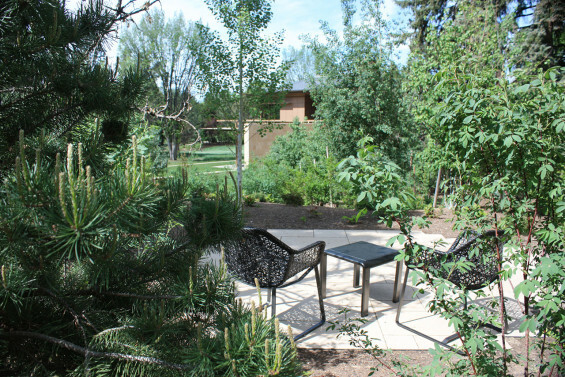 The “Conversation point” is nestled in the aspen grove at the highest point in the garden, offering both sun and shade at various times throughout the day. Denver is a challenging place for introduced trees — its arid prairie character and the extremes of the weather make it suitable for only the hardiest species. Working in this environment called for us to protect a number of existing large trees and import a whole new forest of locally appropriate trees, including the aspens. While recognizing that aspens are a mountain and not a prairie species, they have proven adaptable well to urbanization. The water feature reflects everything around it and offers the soothing sound of precious water in this arid landscape. The black granite cube of water is surrounded by a clipped hedge of native dwarf dogwood. We retained the remnants of a gigantic waterfall feature in the new forest, partly to retain the site’s history, but mainly because a fox lived in its boulders, as well as two mature pinion pines. 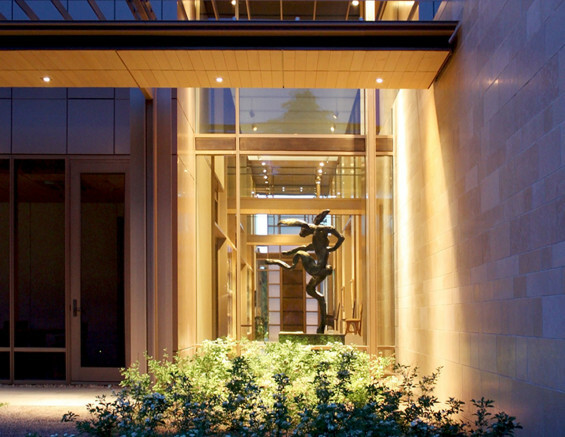 The client has an extensive collection of hare garden ornaments and sculptures, especially the enormous sculpture, “Hare” by the late Barry Flanagan, which now stands in the window of the grand foyer to entice the resident fox. The remnants of an existing water feature were preserved because of a fox den. The fox became a counterpoint to the rabbit sculpture collection of the owner. Site Plan | 1. Lawn, 2. Great Meadow, 3. 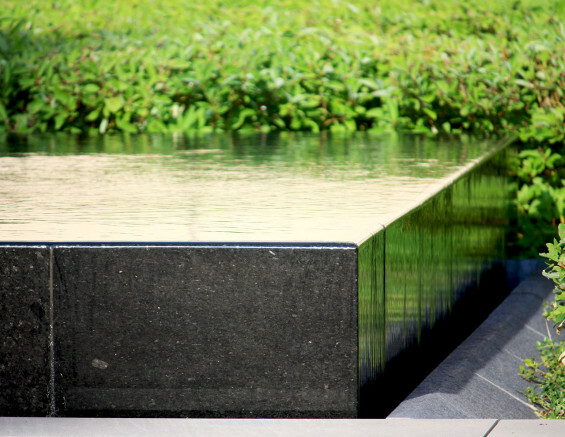 Black Granite Water Feature with Sculpture, 4. Fox Habitat, 5. The Stroll, 6. Meadow Steps, 7. Stairs to Aspens, 8. Conversation Point, 9. Daffodils, 10. Oak Grove, 11. Auto Court, 12. Secret Garden, 13. Red Twiggery, 14. Big Oak, 15. Welcome, 16. Pines, 17. Aspens, 18. Great Terrace.